It all started with Times photo editor Darcy Eveleigh discovering dozens of these photographs. She and three colleagues, Dana Canedy, Damien Cave and Rachel L. Swarns, began exploring the history behind them, and subsequently chronicling them in a series entitled Unpublished Black History, that ran in print and online editions of The Times in February 2016. It garnered 1.7 million views on The Times website and thousands of comments from readers. 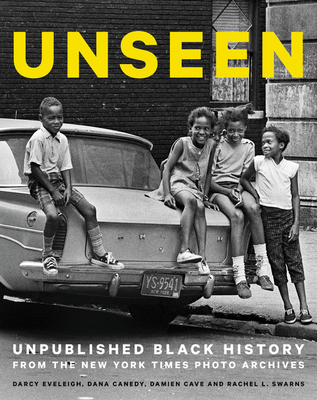 This book includes those photographs and many more, among them: a 27-year-old Jesse Jackson leading an anti-discrimination rally of in Chicago, Rosa Parks arriving at a Montgomery Courthouse in Alabama a candid behind-the-scenes shot of Aretha Franklin backstage at the Apollo Theater, Ralph Ellison on the streets of his Manhattan neighborhood, the firebombed home of Malcolm X, Myrlie Evans and her children at the funeral of her slain husband , Medgar, a wheelchair-bound Roy Campanella at the razing of Ebbets Field. Were the photos--or the people in them--not deemed newsworthy enough? Did the images not arrive in time for publication? Were they pushed aside by words at an institution long known as the Gray Lady? Eveleigh, Canedy, Cave, and Swarms explore all these questions and more in this one-of-a-kind book. UNSEEN dives deep into The Times photo archives--known as the Morgue--to showcase this extraordinary collection of photographs and the stories behind them. Darcy Eveleigh is a photo editor The New York Times and the creator and editor of The Lively Morgue, a Times blog and Tumblr series. Follow Darcy on Twitter @DarcyNYT. Dana Canedy is the administrator for Pulitzer Prizes. She is a former senior editor at The New York Times and was part of a team that won a Pulitzer Prize for national reporting for "How Race Is Lived in America," a series on race relations in the United States. She is the author of A Journal for Jordan: A Story of Love and Honor. Follow Dana on Twitter @DanaCanedy. Damien Cave is the Australia Bureau Chief for The New York Times. He was formerly the Deputy Editor for Digital on the paper's National desk and a correspondent in Mexico City, Miami, Baghdad, and Newark. Follow Damien on Twitter @DamienCave. Rachel L. Swarns is a journalist and author who writes about race and race relations as a contributing writer for The New York Times. She is the author of American Tapestry: The Story of the Black, White and Multiracial Ancestors of Michelle Obama, which was published in 2012. Her upcoming book about Georgetown University's roots in slavery will be published by Random House in 2020. Visit Rachel on Facebook (rachel.l.swarns) and follow her on Twitter @RachelSwarns. "Maya Angelou said that 'there is no greater agony than bearing an untold story inside you. Indeed, there is an agony in our nation that the stories, the voices, and the images of Black Americans are so unknown, untold, and unseen in our wider understanding of history. This bountiful collection of once-unpublished photographs both gives expressive voice to their subjects and helps to relieve this agony, bringing to life a more complete picture of the compelling, complex, and beautiful story that is America. "—Cory Booker, U.S. senator and bestselling author of United: Thoughts on Finding Common Ground and Advancing the Common Good.